A pike trip planned to the river Wye with my good friend Chris was understandably postponed due to the flooding, so knowing most other venues would be hard due to this we decided to head to Old Bury Hill in the hope of a few runs. Dad was also joining us so meeting up early afternoon we made our way up the long bank, once again in the rain. As expected sport was slow up until dusk and apart from one run that l missed things didn’t look good, yet the switch we were hoping to be triggered happened and in a short flurry of action Chris managed two zeds which included a new personal best of exactly 10lb, dad also managed two, yet fishing in a new swim l was still to get of the mark. Casting every half an hour with fresh baits normally gets some action and at around 7pm another short feeding spell bought me two zeds, the best around 7lb plus a double figured mirror. Dad also managed two more zeds and not to be beaten a common weighing 17lb 15oz. Chris’s swim had strangely died and as usual it looked like dad was going to show us youngsters how it was done, however when we decided to call it a day at 9pm both my rods went of and with two more zeds in the net, the best 7lb 13oz it bought our scores level. Although the fishing wasn’t hectic it was a really enjoyable evening with plenty of light hearted banter plus a few fish, how fishing should be. We are sensible anglers, get us out of here! Its rare that l have to use my return visit policy when guiding, yet a few weeks ago whilst zander fishing at Old Bury Hill myself and regular customer Mark came up against the odds and found ourselves on a night when the fishing was impossible. We knew what it was, the full moon and although Mark did catch a personal best carp, it wasn’t his target, so a return visit was planned. With a weather front that had placed around thirty rivers on flood alert in the west country moving east the session was almost abandoned, yet l know that the worse the weather, the better the fishing. Arriving at 2pm we headed to my preferred area along the long bank and soon had four rods fishing sardine sections. The night before had seen loads of cold heavy rain enter the lake and l had reservations whether this would have killed the lake, yet a pike being weighed by another angler raised our hopes. It wasn’t until the light started to fade that Marks indicator rose slowly to the rod blank and a firm strike saw a powerful fish hooked, yet unbelievably it was yet another carp, this was getting a bit silly now. Luckily a couple of small zander soon followed and with his first zander netted we started to relax, yet with the wind gaining we knew our stay could at any point be cut short. To give Mark a good chance of catching a few fish we had agreed that although l would work my rods he would take runs on them, however once he had caught a seven pounder l would swap the right-hand reel handles back so l could have a fish. Fortunately most of the following runs came on his own rods and with a flurry of action that saw him net two good zander weighing 8lb 10oz and 8lb 7oz at the same time l decided to have a fish. Re-baiting with fresh baits l cast back out and straight away got a run which saw a very big zander grace my net. Weighing exactly 12lb l knew l was one very lucky angler and realised that the fishing god was once again looking down. We both took another zander before the wind started to strengthen and once the rain arrived around 9.30pm we looked at each other, knew we had booth had a brilliant session and screamed ‘we are serious anglers, get us out of here’. Whilst this weather is still mild, the zander fishing is still good, yet once the winter sets in it gets harder so if you fancy a go you better get in touch soon. 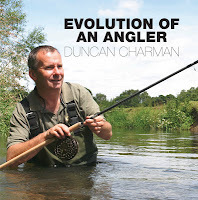 I can now confirm that the book launch will be at The Carp Societies Sandown Show on Saturday 1st and Sunday 2nd December. I will be personally signing limited edition numbered books over this weekend, however if you would like one of these limited editions and cannot make the show then these can be ordered online at www.calmproductions.com however you will need to order you’re copy prior to the show. I will also be spending a day at Yateley Angling Centre on Saturday 15th of December between 10am and 4pm, so again if you want a signed copy then come along. If you want a sneaky preview of one of the thirty one chapters in the book then there is one on carp fishing the Thames that can be downloaded on Calm Productions website. The book covers my progression as an angler, evolving from a match angler in the early days right through to what most know me as today, a specimen angler. The book isn’t just a good read but also a bringing together of my love for photography and almost every page has a full colour image shown and taking into consideration it has over 350 pages, that’s a lot of photographs. The book covers my quest to catch most species including eels, carp, barbel, bream, in fact almost every freshwater species that swims and covers some fantastic venues such as the river Kennet, Itchen, Thames and Loddon as well as stillwaters like Lynch Hills Willow Pool, Thorpe Park, Westhampnett and of course Frensham Great Pond. It also covers the capture of two British records, visits to France and Spain plus a chapter on ‘The fish l wish I’d never caught, twice’. There are no secrets within the book; no this is how l did it, just a good honest read that will appeal to not just the club angler but also to those targeting fish of a lifetime. If you’re struggling for ideas to give the wife or girlfriend for Christmas then look no further. The cost of the book is £25 plus P&P if ordered online. Although l have helped numerous angler have a memorable day on the Lower Itchen Fishery, l have never fished it for myself, so with a Coarse and Match Fishing Monthly video requested by OnlineFishing.tv on grayling fishing, l grabbed the opportunity with both hands. Arriving at opening time, 8am, l found l had the stretch to myself and headed for the centre of the fishery, an area Clayton the onsite river keeper had pointed me to. Starting on the float l covered loads of swims, catching from all but two and come 2pm l had lost count of the grayling that ld landed, along with lots of brown trout plus a couple of salmon parr. The last swim l fished on the float saw loads of grayling intercepting loose maggots, however bites were difficult to come by, that was until l made a tiny alteration to my hookbait, thereafter it was a pound plus grayling a cast. Once the rain arrived l decided to head to a big pool upstream, one that is almost impossible to fish on the float and try the feeder, something l will only do in such a situation. It took all of ten seconds for the tip to twitch and the first of many brownie of see the bottom of the net. Although two good grayling did find my bait, plus a sea trout, it seemed as if the grayling pool had been invaded by brown trout and after around a dozen or more, and with the rain beating down, l headed for the comfort of the car. The video will be edited and ready to view soon, so keep an eye out on www.coarseandmatchfishing.com for one of many of my ‘In Session’ with Duncan Charman videos. If you fancy experiencing the fantastic non-stop rod bending action The Lower Itchen Fishery offers then why not book a day with me. You won’t be disappointed! Although l still cant confirm if the book will be ready for launch at the Carp Societies Carp Show at Sandown on the 1st and 2nd of December, l can confirm that l will be signing books at Yateley Angling Centre on Saturday the 15th of December between 10am and 4pm, so if you want a signed copy then make it a date. Further information on cost, online ordering to be published soon. Apart from a dismal two-day trip to Chew last year, it’s been over a decade since l seriously targeted pike. My exploratory trips thou to the river Wye in search of barbel earlier in the year had revealed a few likely looking haunts and with the occasional large bow-wave spotted behind the odd unlucky dace, my mind started to wonder. Fortunately l have teamed up with another angler who like me wanted to unlock its secrets, so a two day trip was arranged and early one morning we headed north. The first day was more about walking, looking and if we were lucky casting a deadbait which would be slowly retrieved in a sink-and-draw fashion. First port-of-call though was to Woodies to get the necessary tickets as well as draw on his wealth of knowledge, as if there was one man that could put us on fish, then Paul was our man. Unfortunately the place Paul wanted to send us was closed to the Wye three day festival, so with a couple of other stretches at our disposal and prime swims pinpointed we headed of with high hopes. The first swim we looked at and tried was a deep pool just above some shallows, home of a very large pike, yet an hour of working the swim failed to produce, so we moved to another stretch. I’d thought about the tactics that l wanted to try and this was to place a static deadbait within the swim, then sink-and-draw over the top. It’s a tactic that l have read about working for others and one that creates the best of both worlds as some days pike want a static bait and then on others they want it on the move. The second stretch we fished already had a few pike anglers on, one had taken three on lures, another had pulled out of a fish on the opposite bank, however with loads of bankside cover there were plenty of swims to try, yet these were tight, features either side, and thoughts of hooking a big pike at first was somewhat daunting. Id rigged the static deadbait up on a Korum 2.75lb Carp rod with 40lb braid loaded onto a KZR Mini Pit 6000, a couple of drilled bullets to hold bottom in the slack created by the cover along with a Snapper size 6 trace witch held a sardine, my favourite deadbait. The sink-and-draw rod was toned down to a 1.75lb Neoteric XS Twin Top with the same reel and braided main and this time a smelt was mounted on a size 8 Snapper trace. Because l was going to move swims and the differences in the flow l weighted the bait by sliding a length of pole float rubber onto the braid, then pinched swan shot on. The rubber protects the braid and the weight can be altered with ease. With the deadbait positioned l started to work the smelt over the top, yet after twenty cast nothing had happened. Down to my left was a big snag which allowed a risky cast right down the edge in just a few feet of water. The cast was bang on and after just two turns of the reel l watched as a good double shot out and grabbed the bait. A tense fight commenced before she was netted and l punched the air as it was my first Wye pike. Twenty minutes later we were on the move again, searching different swims and watched as another angler netted what looked like a twenty on the far bank. Keen to keep on the move we headed upstream, yet the odd likely looking spot failed to produce, however a swim mentioned by a barbel angler had to be investigated and once again the smelt did the business, this time on the first cast with a pike around six pounds. The light was going and having found numerous swims for future reference we headed back to the B&B in Ross. The alarm sounded well before dawn and with a couple of hours before breakfast we tried another spot well known for pike. This section looked great, yet our efforts went unnoticed, however an angler had arrived just before us, settled in a swim and caught a low double plus missed a run, so it certainly wasn’t time wasted. After breakfast we headed back towards Hereford and l dropped into the swim that had produced the double the day before. This time the sink-and-draw failed to produce so l added just enough weight for the rig to hold bottom and carefully cast it, once again under the snag. I’m not a great lover of using alarms and drop of indicators, much preferring to watch the rod tips for a signs of a pickup. I didn’t have to watch for long as the left hand rod tapped before the clutch started to turn. A firm lift was met with a satisfying curve on the rod and soon l was admiring another good double. Soon after a recast the same rod signalled another bite and as soon as l lifted into this fish l knew it was far bigger. She tried to make the upstream snag a couple of times and l had to clamp down on the clutch, yet the rod turned her and after an explosive tense fight l found myself looking at what l thought was my target, a twenty pound Wye pike, yet the dial on the scales dropped short, yet was l disappointed, no way. The swim died after this so we decided to head to another stretch to locate an area that’s known for producing. Leaving the tackle in the car we found the swims, yet due to the long walk we decided to keep these for another day and headed back into Hereford to watch the weigh in as well as talking to the match anglers to see if they were experiencing any pike trouble, which they were, however after the match had finished our sardines were totally ignored as these pike were feeding on the vast shoals of dace and roach. Having learnt so much, located numerous swims for the future and with a few pike under my belt l left a happy angler and thoughts of a return visit were already floating around in my head. It’s a great start in locating areas to take customers pike fishing on the Wye. Earlier this year l started guiding on the Wye for barbel and in two incredible weeks, one in September, the other in October we took more than one hundred barbel, as well as loads of chub. Next year as well as the two weeks barbel fishing, l will be available to guide pike anglers on this incredible river as well as fishing for dace, so if you a couple of days of contrasting fishing, why not get in touch and book you’re spot! Personal best Carp on a sardine! Mark had read about how carp get caught on sardine section at Old Bury Hill whilst targeting zander and although he believed this, he actually wanted to see if it was possible. Mark has fished Old Bury Hill many a time in the past but had never caught a carp from it, let alone a zander, so it seemed a good idea to see if we could edge our bets and target both. Unfortunately the conditions were terrible. Loads of cold overnight rain had entered the lake and coupled with a clear sky revealing a full moon, a cold North West wind, atmospherics rising and temperatures dropping down to just 2.5 degrees, things looked bleak, especially when the feeding spell arrived and the fireworks of the previous evening failed to materialise. Even on the cruellest of conditions, a few zander show, yet this was the first ever evening when the lake fell dead, that was apart from one hungry carp that picked up Marks sardine section and gave him an enjoyable run-around on scaled down balanced tackle. In the net she went and on the scales gave a reading of 17lb 9oz a new personal best for him. Well happy with the result we continued well into the evening, even with me casting a couple of rods out to give Mark a better chance but apart from a fast take that was missed, probably a carp, the zander decided to go on hunger strike. Although beaten on the zander front, Mark left a very happy man and with a return visit planned in a few weeks, we will be back for revenge. A Christmas present with a difference! Over the last couple of months an incredible amount of wives and girlfriends have contacted me to buy their love ones a birthday or Christmas present with a difference. It seems that when it comes to giving them tackle ideas, we seem to have everything, however getting the best from a swim, increasing your catch rate or even catching a personal best isn’t something that can be bought from a tackle shop. If your wife or girlfriend keeps asking for ideas then it might be an idea to pass on my details, you never know, when you open your next card a voucher headed ‘A Day out with Duncan’ might just drop out. You don’t even have to worry about the finer details such as venue, species and date, as this can be organised between us at a later date. Halloween was a typical moody night and the full moon that appeared momentarily between the rain laden clouds that raced through the night sky on a brisk wind only heightened our spooky feelings. Zander, or as we called them vampire fish for the night were our target and with three anglers that had never seen, let alone caught one, expectations were high. Obviously we were on the banks of the best day ticket zander venue in the country Old Bury Hill and with the permission to stay late and conditions what seemed perfect we set our traps. Sardine sections hair-rigged next to a barbless size six hook were cast out, no more than twenty yards and we sat back awaiting the switch to be struck. James was of the mark first with a small pike, yet we had to wait till dusk before the bobbins began to twitch. I’m not sure who landed the first zander as all of a sudden runs were coming all over the place and in a hectic couple of hours the trio had taken their fare share, however once again this was from fish up to around six pound. Andy then found himself attached to a much more powerful fish which turned out to be a carp weighing 14lb 12oz. Just as this was returned Adrian also landed a carp, slightly smaller at 12lb 13oz. Things then as expected quietened down with just the odd run coming, however it was young James who landed the best zander of the night which weighed 7lb 7oz. With the runs slowing and the heavy rain that was forecasted beginning to fall we headed home, the trio taking around fifteen fish between them. Sue bought her husband, Allan a day’s barbel fishing with me as a birthday present and what a day it turned out to be. Allan hadn’t fished the river Loddon for a number of years, as he moved to France some years ago, however whilst visiting family here we managed to arrange a date to coincide with this visit. Meeting at 7am and with barbel on our minds we headed straight for a banker swim, however this had changed somewhat over the past couple of weeks, due to the heavy rains and although called the jungle, now resembles a battle field. Dropping a bait in we sat uncomfortably as we knew that if a fish was hooked then the favours of an escape was heavily stacked in its favour and come thirty minutes later, and after a couple of taps we remained fishless. Moving to a swim upstream Allan soon learnt the importance of holding the rod, or covering after a tap, as the tip flew round and somehow the bite was missed. Reeling in Allan found a minnow impaled on the point of the hook, a very unlucky situation as it seems a barbel had found our bait, sucked everything in, including the minnow probably and the masked point failed to hit the mark. With two productive swims covered and just one left we headed downstream and soon after settling in Allan found himself attached to an angry barbel that did everything in its power to avoid capture, yet constant pressure did the trick and a big barbel surfaced. It was a typical Loddon barbel, short and fat and hopes of a double were soon realised as the dial settled on a satisfying 10lb 5oz. By now the early morning mist and light covering of frost had made way for warm sunshine and as we headed downstream we were greeted with spectacular views of the English wildlife including Deer, Buzzards and Red Kites. The next swim failed to produce but the boundary swim didn’t disappoint as first a strange looking personal best chub of 4lb 14oz was netted before hope for the future in the form of a barbel weighing around 3lb 8oz. On a high we covered plenty more swims, yet the tip remained motionless. More anglers were turning up and heading right upstream we dropped into a known chub swim which yielded another of 4lb 12oz. The final swim failed to produce but with the light fading and the night-shift arriving we headed home, well happy with four fish from a difficult river. If you want a days fishing with me and are lost for ideas to give the wife for Christmas or you’re birthday, then why not pass on my details, you never know you might just have a red-letter days like Allan had. When Mat Vickery contacted me with the intent on catching his first ever zander, l thought, Old Bury Hill, October, no problem, however Mat is a very keen lure angler and his intension was to catch one on a lure. I must admit l have watch others anglers lure fish and have never seen much joy, especially on the zander front, however I was keen to watch how a good lure angler retrieves. Unlike how must anglers fish, mat retrieves very slowly, not unlike ‘sink and draw’ fishing for pike and was soon into a fish, albeit a pike. A few more hits were missed before the thumbs up came and Mat landed his first ever zed on his preferred method. As the witching hour approached the next method, sardine sections hair-rigged started to get some attention and it was long before the first zander fell, one of around five pounds. The action then increased and come 8.30pm around another dozen had been taken, the best maybe 7lb, oh, and another bream! Obviously the cold snap over the weekend has encouraged them to feed and come later in the week when the atmospherics are meant to fall; one lucky angler might just find themselves having a red-letter day.